If you like Rastamouse, then don’t miss our competition to win a whole bunch of Rastamouse goodies! Click here to find out more! 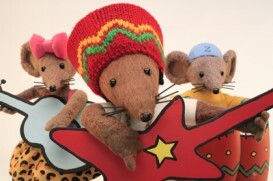 We are all very excited here at Fun Kids about a brand new show coming to CBeebies called Rastamouse! This show follows the adventures of the music-making, skateboarding, crime-fighting Rastamouse and his crew! As well as crime fighting, he’s also in a great band called ‘Rastamouse and Da Easy Crew’, and they have a fantastic new single out for you to listen to called ‘Ice Popp’! Featuring Reggie Yates from Radio 1’s chart show, we really like it and so we’ve put it into our super music database so you can hear it everyday on your radio! In fact, why not see if it’s playing right now?